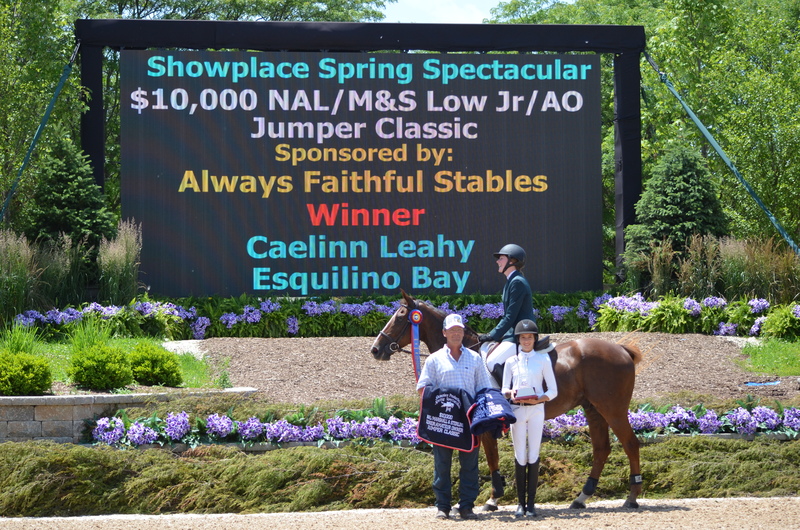 Caelinn Leahy and Kaner 88 were consistent ribbon winners in the Low Junior Jumpers at Showplace Spring Spectacular. 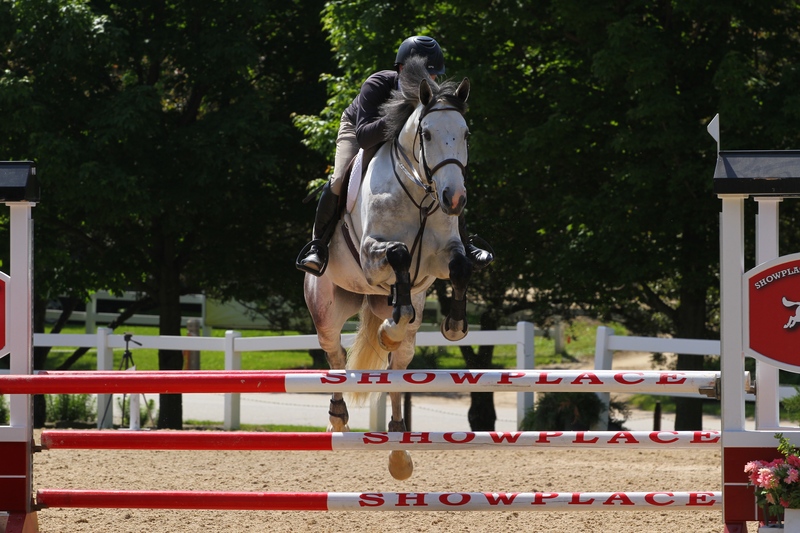 Maple Park, IL-July 7, 2015- Steve Schaefer’s Bellis Show Jumping Stables recently returned from a successful stint at Showplace Productions’ Spring Spectacular Horse Show in Wayne, IL. 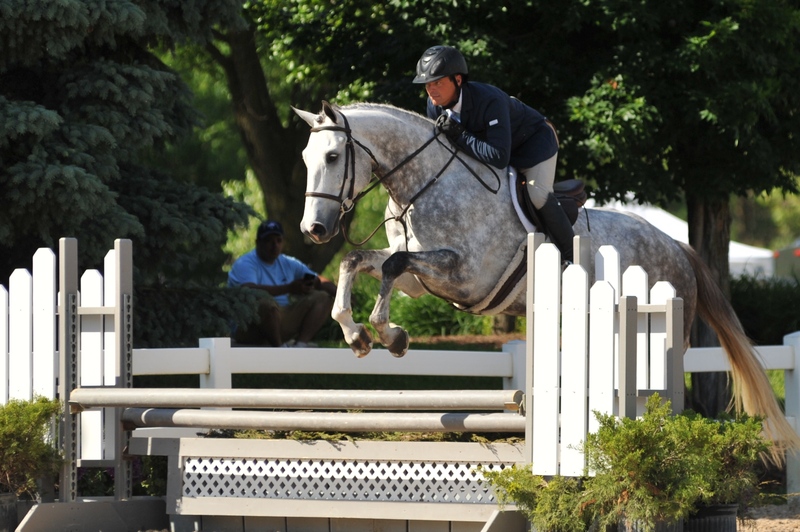 The “move up” motto was certainly in effect for the farm, which specializes in hunters, jumpers, and equitation. 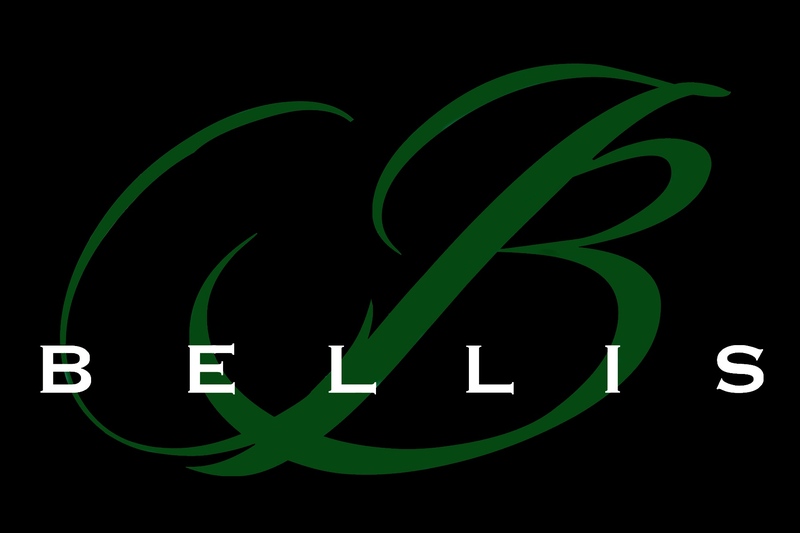 Bellis Show Jumping Stables offers training from beginners to the Grand Prix level and works to give riders the confidence and the skills to safely and competently move up to the next level. Additionally, Schaefer works to help riders become competent in their current division. Schaefer has worked with many riders from the short stirrup ring to the Grand Prix such as Josh and Kristen VanderVeen who own Bull Run Farm in Elburn, IL. Schaefer, who was Champion in the Low Training Jumpers with Matt Yeterian’s Eclipse, elaborated on the philosophy that allows his horses and riders to thrive. “I was asked recently, how do you make these horses jump? I thought about it a bit, and in today’s world all these horses are bred to jump, and my job, my goal, is to allow them to jump. They love it. They love the freedom jumping big provides them. My philosophy in one word, freedom. People ride to be free, horses perform best in the spirit of freedom. All issues can be addressed through the expression of being free,” said Schaefer. Steve Schaefer aboard Christy Cressey's Cresswood Bach. Schaefer’s philosophy has helped not only his students, but has also aided him in starting young horses as well. Schaefer moved Christy Cressey's Cresswood Bach from his familiar home farm to the show ring at Spring Spectacular. 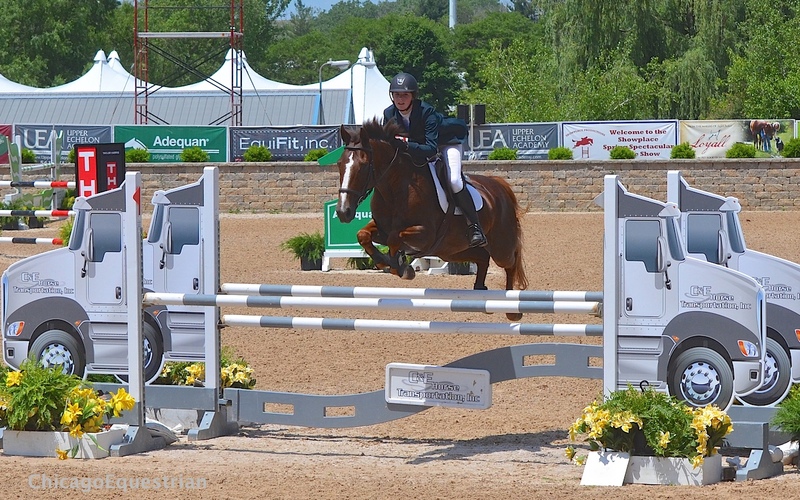 He rode the young horse to the Baby Green Hunter Championship at week three of the Showplace Series, and another young horse, Cresswood Barrington, is progressing well in the jumpers. Steve Schaefer and Cresswood Barrington. Cressey, a long time friend of Schaefer’s owns Cresswood Farm, and is President of the Massbach Hounds and Fox River Valley Hunt. She has several horses with Schaefer, and praised his ability to work with young horses. “I’ve known Steve for many years, since he was an up and coming rider. He has the consistency and patience to work with young horses and great morale around the barn. He’s careful and meticulous with his care and attention to detail involving the horses,” said Cressey. Bellis’ recent success at Showplace Spring Spectacular’s Series has been a result of the hard work and careful preparation Schaefer takes to insure his rider’s success. Caelinn Leahy rode Laura Steffee’s Bloesem to the Low Junior Jumper Reserve Championship in week two and was Reserve Champion again in week three aboard Esquilino Bay owned by Bellis Ltd. Leahy also got to "move up" and try a High Junior Amateur class, which she handled well. In the $2,500 Low Junior Jumper Accumulator, Leahy took the top honor aboard Kaner 88 and was fourth as well aboard Bloesem. Leahy was a consistent contender in the Low Junior/Amateur Classics each week, taking the blue ribbon week two with Blosem and Esquilino Bay earned the top spot week three. Her other mounts were in the top four places each week. 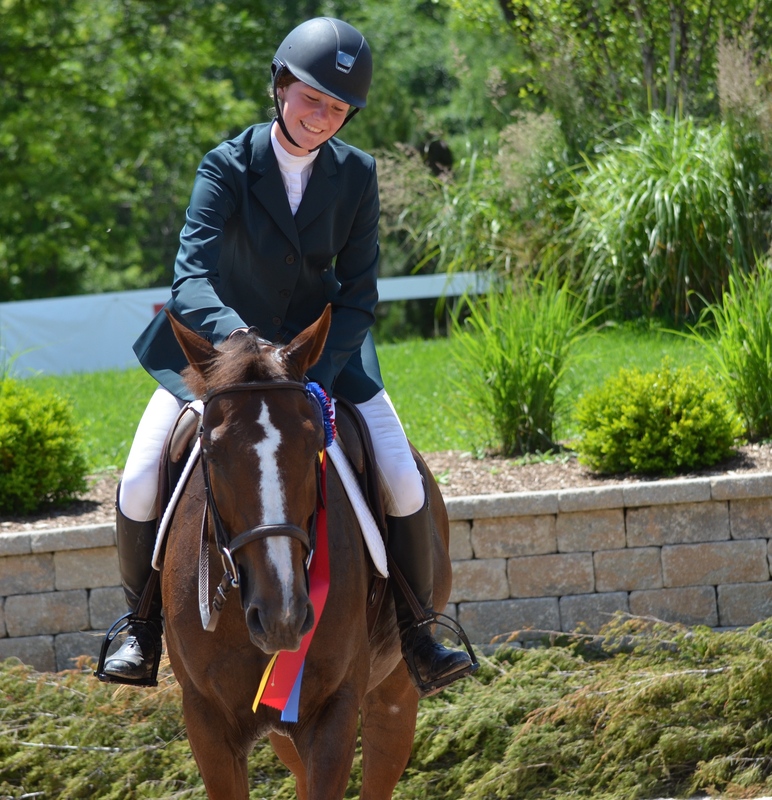 Leahy recently had another opportunity to "move up" at the Showplace Summertime Series, where she rode Esquilino Bay in her first Grand Prix, a big step up for a 13-year-old student at Elgin Academy.